The 7/8” diameter plain steel or PVC mini rollers are similar to our 3/4” micro rollers series except for the roller itself. Our plain steel roller is 13 gauge with a capacity of 45 lbs. while our PVC roller has a capacity of 10 lbs. and is non-marking. Both are ideal for light packages and cartons while the 7/8” steel tube can take much more abuse. 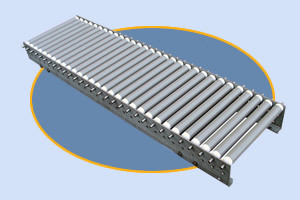 Micro and Mini Conveyors are also available in curves, please consult the factory.